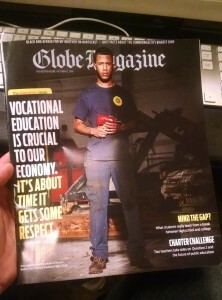 Congrats to Geek Office’s member Deborah Halber on her cover story in last week’s Boston Globe Magazine. Deborah’s story “It’s Time for Vocational Schools to Get Some Respect” looks at the long wait lists and out-of-date facilities of the state’s “voke” schools and profiles several promising students. Deborah is a member of Writing Lab, a group of freelance and staff writers at GeekOffices coworking space in Cambridge whose alums include Boston Globe Magazine editor Michael Fitzgerald, who edited Halber’s piece. Are you a writer or other creative individual looking for flexible coworking space? If so, check out our co-working space in Cambridge’s Inman Square. Geek Offices is a coworking space offering all the amenities of a professional office, with none of the overhead. Technology workers and non profit organizations looking for shared co-working office space in Cambridge or Boston will find that Geek Offices provides some of the most affordable co-working space in the region. Compare Geek Offices to the prices and amenities of executive offices and other incubator spaces in Cambridge and Boston and you’ll be surprised by the value we offer.